Description: One of the last loaded detour coal trains pounds out of La Crosse. Description: Detour loaded coal train C-BTMCGW. Description: Another DPU beings up the rear on this eastbound coal laod as it enters the Dilworth Yard. Description: CSX U994-31 splits the retro B&O CPL's at Sterling interlocking. It is only a matter of time before these signals are torn down in place of the Darth Vaders which can be seen in the background. Description: A neat "between the trees" shot at Larkspur of just the cab. Description: NS freight crossing Lake Decatur. 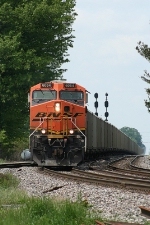 Description: BNSF trio waits on the siding for a crew at Elsberry MO. 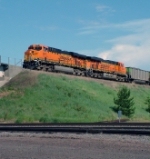 Title: BNSF 6064 Brings a coal load Sb onto the K line at Falk.. Description: The unit coal train DPU. Description: BNSF 6064 ES44AC poses for a photo at the BNSF Irving depot, once a Frisco facility. General Electric built this motor at Erie for BNSF in August 2006.